Best Blog in the 2014 Running Awards – Thank You! All weekends are created equal but some weekends are more equal than others, or something like that. We incredibly lucky Veggie Runners had the most fabulously unequal weekend ever – hurrah! 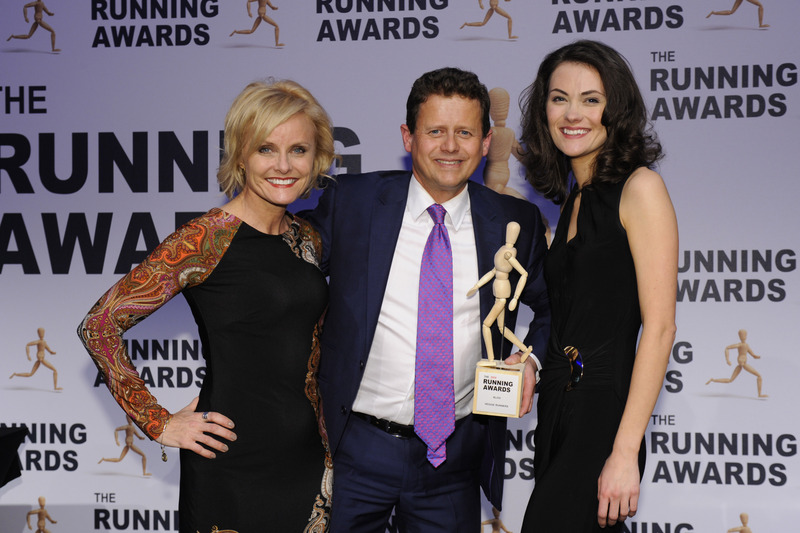 First, we went to the glitzy Running Awards ceremony in London. We wore our best frocks, put some slap on and rocked our high heels (or more like rocked about/wobbled in them until we could cope no more – us and heels, not a great combination). The do – we’re from Up North; it may be a ceremony to some but it’s a ‘do’ to us – was marvellous. We hung out with some of our favourite running bloggers: Lazy Girl Running, Simon Freeman, Liz Goodchild, Leanne from Run Mummy Run and Lunges and Lycra, y’ know, totes our running homies… We met brand new lovely people, such as Barefoot TC, and finally came face to face with pals who we’d only ever emailed with, from Yurbuds to Breathe Unity. We love people, we do. We were having such fun wining and dining and chatting negative splits and blisters that we kinda weren’t too fussed about winning. But then we did – win, I mean – and totally changed our minds. We’ve never been more yippee in our lives! Drumroll. Silence. Our names were called by the famous man from the TV (Mike Bushell, a runner himself). ‘And the winner is… (pause for effect) … Veggie Runners!’ Holy flippin’ yahoo!! We won. You helped us win, we love you. Yes, we did get a bit emotional but thankfully they didn’t let us make a speech or we’d still be there blubbing. Nobody starts a blog to win awards. We created ours just to blather on with like-minded people, but have inadvertently found the best, funniest community who provide us with such support and lovely feedback. We literally could not have done this without you – thank you so much!! Thanks Mary! It was nice to be out together, not wearing our usual lycra and no make-up. Thank you Tim – look forward to meeting you again at another event.